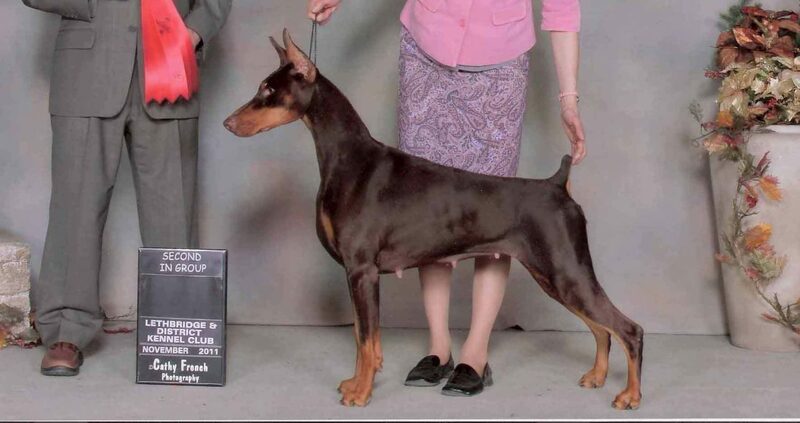 Denmel Dobermans is a Canadian Kennel Club registered Kennel name, owned by Denise Mellor of Calgary AB Canada. I am a member of the Canadian Kennel Club, Alberta Doberman Pinscher Club, Doberman Pinscher Club of Canada and the Doberman Pinscher Club of America. I have served on the Board and various committees with the ADPC, and DPCC, presently I am President of the ADPC and very involved with the Specialty Committee as well. I purchased my first Doberman in the late 1970’s and became a fan of the breed. Since then I have become more involved in showing in Conformation both in Canada and the USA, and have trained in Agility, Rally Obedience and Nosework with my dogs. I have recently been competing in Rally Obedience and started in Scent Detection with my G’Reth, but have great appreciation for owners who manage to accomplish far more with their dogs. . Please feel free to browse through our site at your convenience. If you are an admirer of Dobermans but just thinking about owning one, please visit our links page to connect to helpful information about the breed. We here at Denmel do not breed often, but will be happy to refer you to another breeder if you are looking for a puppy. If you have specific questions about the breed or my dogs, I will try to help if I can. I would encourage you to do your homework, buy from a reputable breeder that is helpful and answers your questions. The more you educate yourself about Dobermans, the more intelligent questions you can ask. Please research the breed health issues from the links. Dobermans are sometimes affected by some major health issues which can result in early death, some of which are DCM (Dilated Cardio Myopathy), CAH (liver disease), Wobblers (Spinal problem) to name a few. A normal lifespan is approximately 10 years, with some dying earlier, and some who might live to 12 or 14. As breeders we do not have all the answers to rid the breed of some of these diseases, but recently there have been a few new DNA tests developed which are a good start. It should be noted however that some of these diseases will have other causes yet to be discovered. We do not endorse any puppy mills, or breeding of white dobermans. White is not an allowed colour in Dobermans, and in fact these dogs are true albinos. As such, they suffer from many health issues related to albinism. There are 4 accepted colours of Dobermans in North America, those being: Black/rust, Red/rust, and the 2 dilution colours of Blue/rust, Fawn (aka Isabella)/rust. We usually have litters of Blacks and/or Reds, and try not to breed the dilution colours since they can sometimes have coat issues (Dilution Coat Alopecia).